“Zucchini.” Doesn’t the word just roll off the tongue? Somebody ought to write a song about it. Somebody has written a children’s book about it. In fact, four somebody’s! 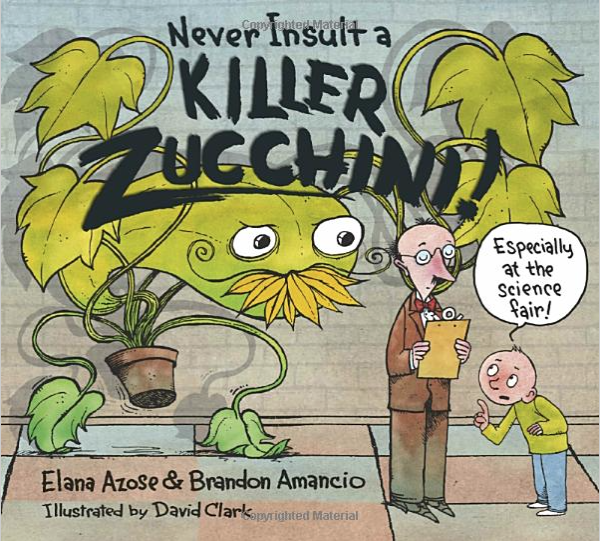 Here’s a quartet of fabulous zucchini books to introduce this giggle-inducing veggie to your kids. Make the introduction. 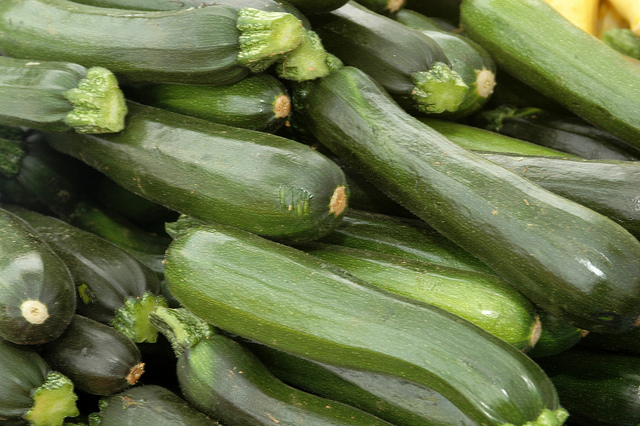 Read a book, and the kids will be clamoring for a zucchini all their own! The shop pictured on the front cover of this wonderfully wacky alphabet book is festooned with zucchini garlands. Giant zucchini lie cheek to jowl with baguettes in the bread bin. 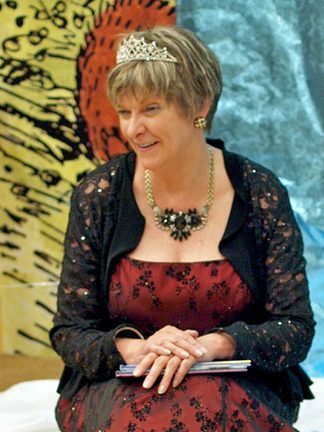 The gumball machine dispenses baby zucchini, and the shop girl sports a zucchini hat and earrings. 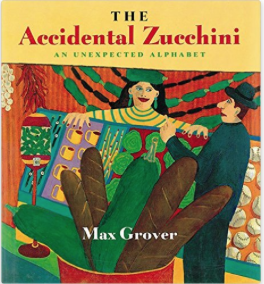 The zany world of The Accidental Zucchini: An Unexpected Alphabet is not entirely vegetables, but Grover sneaks them in on the cover and the “V” spread, a “vegetable volcano” spewing corn, carrots, beets and celery on an unsuspecting city. Delightful fun! Ages 4-7. RELATED ACTIVITY: Pick a letter of the alphabet at random. Have kids choose a veggie or fruit that starts with that letter, join it with a random word that starts with the same letter, and draw a picture for it. Older kids, over a period of time, could create their own crazy alphabet book. Fun! 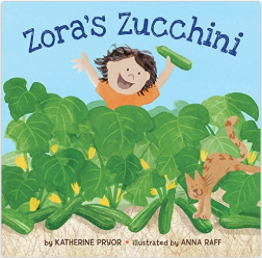 If you’ve ever grown a zucchini plant that just won’t quit, Zora’s challenge will feel all too familiar. 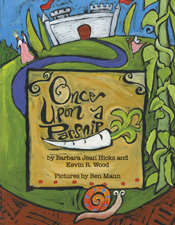 This award winning book captures the wonder of a child’s first garden, the bounty of summer and the promise of fresh vegetables. Fun and accessible, it practically begs to start conversations with kids about gardening, nutrition, problem solving, sharing, community and conservation. A joyful book filled with zest for life! Ages 5-8. RELATED ACTIVITY: Take your kids to the garden store to pick out a zucchini start and help them plant it. But only if you have LOTS of room and want to get to know your neighbors! Robert Squirrel and Edgar Mouse are convinced that their giant zucchini (which grew from a “teeny zucchini” because they sing to it, by the way) is sure to win a blue ribbon at the county fair. Then Humphrey Hog shows up. And Humphrey, it seems, will go to any lengths to make sure his zucchini wins the prize. 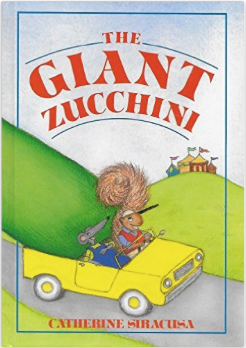 The pictures of various animals carting gargantuan cabbages, carrots and other veggies to the county fair are laugh-out-loud funny, but ultimately, The Giant Zucchini is a story about dreaming big dreams and learning to be both a good winner and a gracious loser. Ages 5-8. RELATED ACTIVITY: Take your kids to the county fair–and look for giant zucchinis! When Mr. Farnsworth, the science-fair judge, declares that he loves zucchinis, the Killer Zucchini is smitten. Until he realizes what Mr. Farnsworth really loves is eating zucchinis! Believe me, the KZ is not about to let that happen. The zucchini is only one of the unusual science projects in this madcap science fair, and engaging back matter provides the real science behind each one. Really, it’s a science book disguised as an alphabet book. And it works either way! Ages 5-8.
Who knew that zucchini could be so much fun?! Photo credit: USDA via creativecommons.org. Used with permission. Book cover images: amazon.